Angry at his brother for abandoning him and at all the quacks who offered them false hope, Pierre-François learned to cope by drawing fantastically elaborate battle scenes, creating images that provide a fascinating window into his interior life. An honest and horrifying portrait of the disease and of the pain and fear it sowed in the family, Epileptic is also a moving depiction of one family’s intricate history. Through flashbacks, we are introduced to the stories of Pierre-François’s grandparents and we relive his grandfathers’ experiences in both World Wars. We follow Pierre-François through his childhood, adolescence, and adulthood, all the while charting his complicated relationship with his brother and Jean-Christophe”s losing battle with epilepsy. 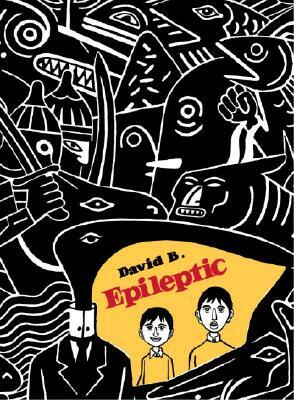 Illustrated with beautiful and striking black-and-white images, Epileptic is as astonishing, intimate, and heartbreaking as the best literary memoir. David B. is a founding member of L Association, a group of French cartoonists who banded together as publishers in 1990 and have revolutionized European comics with their groundbreaking approach to format, subject matter, and style. He has received many awards, including the French Alph Art award for comics excellence in 2000, and he was cited as European Cartoonist of the Year in 1998 by The Comics Journal. He lives in France."